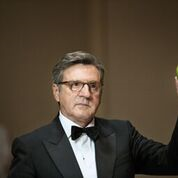 Co-writer and director Roberto Ando’s The Confessions (2016), originally titled Le confessioni, is as riveting in its philosophical discourse as it is in its unique whodunit. Throughout the development of the masterfully paced one-hundred and three-minute runtime of the film, Ando weaves a naturally gripping tale. It concerns an enigmatic Italian monk, Roberto Salus (in a spellbinding depiction from Toni Servillo that dazzles in its underlying power and restraint), who accepts an invitation by the director of The International Monetary Fund, Daniel Roche (in a phenomenal turn from Daniel Auteuil). Such a summons leads Salus to a meeting conducted by The Group of Eight (G8), a civic-minded committee made up of governmental contacts from around the globe, at a luxury hotel on the German coast. That night, Roche asks Salus if he could discreetly engage in the title action. The next morning, Roche is discovered lifeless. Ando brilliantly keeps an ever-accruing sense of mystery and maturity pulsating throughout the proceedings. Such is made evermore alluring when mixed with the complex political, detective and metaphysical components of the production. This is as much a courtesy of Ando’s smart, Hitchcockian direction as it is the same said screenplay he co-authored with Angelo Pasquini. Though much of the plot unfolds via character interaction, primarily intimate speeches among one another, the cerebral suspense rarely wavers. This is because Ando gives us just enough subtly placed notions, questions of personal motivations and uncertainties to keep audiences stirred for the duration of the fiction. Though the answer to whom is responsible for Roche’s demise is obvious, the various paradoxical layers Ando issues on the trail to this conclusion more than make up for this shortcoming. Ando’s ability to avoid genre trappings in so doing is also refreshing. Alongside lavish cinematography from Maurizio Calvesi and mesmerizing music from Nicola Piovani, this Uncork’d Entertainment distribution release is among the year’s best cinematic undertakings. The performances are rich and proficient all-around. For example, Connie Nielsen is terrific as Claire Seth. Moritz Bleibtreu is exemplary as Mark Klein. Likewise, Clelio Benevento’s editing is seamless. Maria Rita Barbera’s costume design is magnificent. With these high-caliber attributes in mind, Ando’s effort astounds from all angles. This is even if the picture is unsure as to what it wants to be on occasion. Correspondingly, it is also hindered by being a bit one-dimensional in painting Salus as saintly. Still, the exertion is graced by an untainted atmosphere of maturity and elegance. In turn, this multi-lingual follow-up to Ando’s witty satire, Long Live Freedom (2013), remains superbly crafted and nonetheless breathtaking. Now showing in select theaters.